December 2014 - Time to hit the road again. Have a look at our photos to see the sights we've seen. November 2013 - Coast to coast - Boston to San Diego and back. November 2012 - Time to visit Arches National Park again. Also, view our Google map to see where we've been. Visit 48 states. During Road Trip Part II we visited some areas that we didn't get to see before such as parts of the heartland in middle America. We also got to revisit the places we really liked in Road Trip Part I like Glacier, Yosemite, and Yellowstone National Parks. Question - So where did you go? Answer - As we have often said, the better question to ask is, where didn't we go? We went anywhere and everywhere from places like Beverly Hills, CA to Flint, MI. 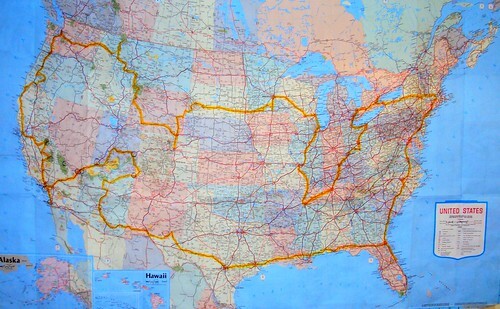 We covered all of the contiguous 48 states and their capitals. We also got to visit many historic sites and national parks along the way. Question - Were you ever sick of driving? Answer - No, not really. Surprisingly, it wasn't that bad. The adventure part of the trip kept it interesting. Question - What were the highs of the trip? Answer - Seeing new places and reconnecting with friends along the way. Being so far from home for so long it was good to meet up with friends and catch up. This was a good source of support. Also, there is nothing like exploring and seeing new places for the first time. Another benefit was meet and talk with nice new people from all over the country. Question - What were the lows of the trip? Answer - Thanksgiving was a trying day. Being away from home was one thing but on this day we happened to visit two memorial sites which were on our list. We paid our respect at the Oklahoma City Memorial and then visited the JFK site at Dealey Plaza in Dallas, Texas. On a brighter note, we did have a traditional turkey dinner at a Cracker Barrel in Waco, Texas. Question - Would you do it again? Answer - Yes, but I'm good for now. After being on the road for over two months it's nice to stay in one spot for more than a day or two; not to mention that there's no place like home and sleeping in your own bed. Visit as many of the 48 contiguous United States. 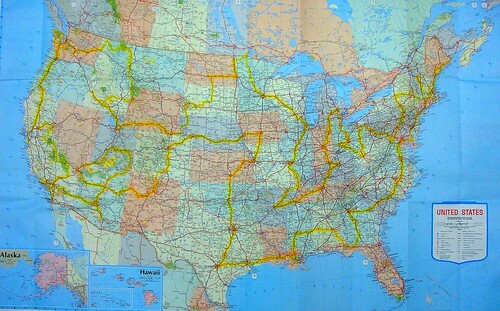 The emphasis of the trip is to visit national parks and other points of interest. While we're on the road and in the area, why not also visit Toronto, Canada and Tijuana, Mexico?